In order to test the HTL compiler and the E Machine we provide some examples. The case study implements a distributed real-time controller for a three-tank system (3TS in short), this is a real application. The system (Figure 1) consists of three tanks T1, T2 and T3 each with an evacuation tap tap1, tap2 and tap3 respectively. 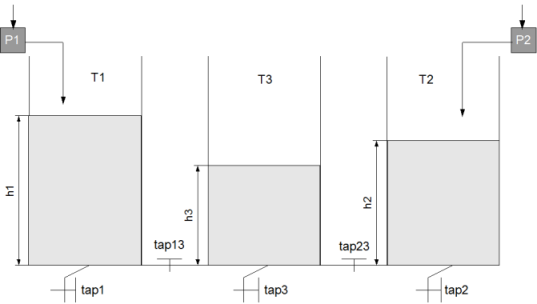 The tanks are interconnected via taps tap13 and tap23. Two pumps, P1 and P2, feed water in the tanks T1 and T2 respectively. The goal of the controller is to maintain the level of water in tanks T1 and T2. The controller is designed to work under the presence and absence of perturbations (simulated by the evacuation taps). 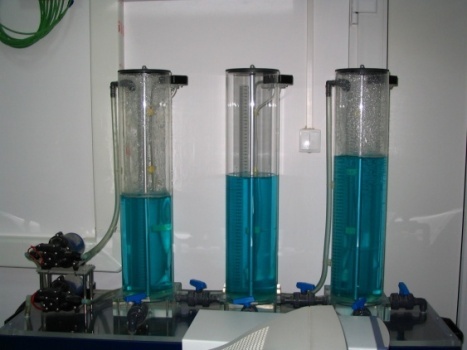 If there are no perturbation a P (proportional) controller is used to control the fluid level. Under perturbations, a PI (Proportional Integral) controller is used. The modeling generates four possible scenarios: (1) both pumps controlled by P controllers, (2) P1 and P2 controlled by P and PI controllers respectively, (3) P1 and P2 controlled by PI and P controllers respectively, and (4) both pumps controlled by PI controllers. Figure 2. Overview of implementation 98 machine has an AMD K6 processor (133MHz, 192MB RAM). Figure 3 shows the three tank system under action. Three Tanks System (3TS) Simulator: 3ts.tar.gz. This sample program can be found in �steer_by_wire.htl� file. The program is a relatively complex one, there are many modules and modes, and refining programs. This is a very good example for what can be done with HTL. The program is to be run on 8 different hosts. The basic concept of any steer-by-wire architecture is the removal of the mechanical linkage between the steering wheel and the wheel. The mechanical linkage is replaced by a set of steering wheel angle sensors, an electric motor that controls the wheel angle, road wheel angle sensors and some electronics that compute the closed loop control system. To maintain a realistic road condition feel for the driver, there is also a force feedback actuator on the steering wheel. How To Run Steer By Wire Example? First of all each module has to be mapped to run on a particular host, by default the mapping is for the local host (don't forget to modify the makefile to point to steer-by-wire.htl file). Next for each host which is defined in the HTL program, it has to be performed a new compilation of the HTL program and the E Machine. After E Machine was compiled for a host, the resulting binary file (e-machine), has to be saved, since a new compilation will override the previous file. In the end each E Machine has to be run on the particular host, for which it was compiled. The E Machines will synchronize themselves and only after each E Machine was started, the generated E code will be interpreted. when the control error is small, this means we are close to the desire water level, a PI controller with slow integration speed is used. The HTL program used to describe the timing for this control application consists of a root program, which has to modules, one for each pump, that is to be controlled. Each module consists of 2 modes, they can switch from one to the other. One mode implements the P controller, while the other mode implements the PI controller. The mode that implements the PI controller is farther refine, and the refining program consists of one module witch contains 2 modes one for each type of PI controller, again each mode can switch to the other. How To Run 3TS Example? Download the 3TS simulator suite (3ts.tar.gz). 3TS simulator suite consists of two Java programs: (1) a program that simulates the 3TS plant, and (2) a program that can be used to view the signals in the 3TS plant simulator and also to send commands to it. The 3TS controller � is contained in the file: rg3TS.jar. This is a client for the 3TS simulator and can be used to control the plant simulator or just view the signals in the simulator. To run it type: java -jar rg3TS.jar. To run the htl program that can control the simulator, you have to modify the makefile to point to �3TS.htl� and then type "make run THREE_TANKS_SYSTEM=1". Before you run the E Machine you have to start the 3TS simulator. There are two such programs: sched-1.htl and sched-2.htl. One can play with this two programs in order to test the schedulability test algorithm or other features. This programs have only a didactic purpose, they don't implement the timing of a real application as the previous two programs do. How To Run Schedulability Test Examples? This should not be run on the E Machine, they are just to test the schedulability algorithem.